Last month, a major scientific report said that climate change could cost the American economy hundreds of billions of dollars by the end of the century. The report by 13 US federal agencies was a stark warning yet of how a changing climate will alter how we live and work. Still, there is much more to learn about the economic impacts of a warming Earth. Determining the costs of climate change is not easy. It’s a global phenomenon, after all, with global consequences that will be felt hundreds of years from now. 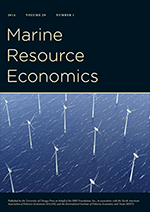 In the Fall issue of the Journal of Economic Perspectives, author Maximilian Auffhammer lays out some of the complexities involved in quantifying the economic damages from climate change. Myriad assumptions need to be made to calculate the social cost of carbon, which is an estimate of the damages to private industries and the larger society from one additional ton of CO2. To figure that out, you need to determine the time horizon being considered, the approach to discounting future emissions and the rate used, changes to environmental risks, and others. The assumptions made can radically change calculated costs. For example, the higher the model’s discount rate — the rate used to compare the well-being of future generations to those alive today — the more we prioritize our current well being over people years from now. There have been significant differences in how government policymakers have approached calculating these costs since the first official estimates were made under the George W. Bush administration. Figure 1 from Auffhammer’s paper shows the evolution of the social cost of carbon for a ton emitted in 2010 (measured in 2007 dollars) used in federal rulemaking. The agencies represented include the National Highway and Traffic Safety Administration, Department of Energy, Environmental Protection Agency, and the Interagency Working Group convened under President Obama. The black diamond indicates the “central estimate” (if one was identified) of the social cost and the gray bars represent the range of costs used in regulatory analyses. The variation between agencies comes from the different assumptions made in their models. To bring some consistency, President Obama created the IWG to calculate an official social cost of carbon to be used across the board in rulemaking. Using a 3 percent discount rate, the cost came to $42 per one ton of emissions made in the year 2020. Raising the discount rate to 5 percent dropped the value of reducing emissions to $12. Obama later commissioned the National Academies of Sciences to assess the IWG’s work and suggest revisions, which it ultimately did in 2017. However, President Trump disbanded the IWG before it could implement the changes. Two current proposed rulemakings under Trump use a social cost of carbon that only considers domestic damages and uses discount rates of 3 to 7 percent. Before considering the Trump Administration's social cost of carbon estimate, please read Scott Farrow's "How (not) to lie with benefit-cost analysis" with a focus on lies #1 and #4. "A Forgotten Legacy of George H. W. Bush"
... The Reagan administration resisted any rapid response to the problem. Congress had funded a 10-year study back in 1980—why rush to costly action until the study was complete? Taking action meant tangling with Robert Byrd, the West Virginia Democrat who assumed leadership of the Senate majority after the election of 1986. West Virginia coal was especially packed with sulfur; new standards might put West Virginia miners out of work. And there the matter stood when George H. W. Bush assumed the presidency in 1989. Bush cared intensely about the Canadian relationship. Bush’s first presidential trip outside the United States took him to Ottawa, in February 1989. On that visit, the 41st president committed to address the acid-rain problem. Bush’s task was eased by Senate Democrats, who elbowed Byrd out of the majority-leader job that same year. The new Senate leader, George Mitchell, represented Maine, a state that suffered especially badly from acid rain. The result was an important amendment to the Clean Air Act in 1990, and a new U.S.-Canada air-quality agreement in 1991. Over the next two decades, U.S. emissions of sulfur dioxide would tumble by 67 percent. True to Bush’s conservative principles, the reduction was not achieved by government command-and-control, but by a market-friendly system: cap-and-trade. The government would set a steadily decreasing maximum permissible limit on total emissions. Underneath that cap, individual firms could buy and sell pollution rights. Those firms that could most easily and efficiently reduce their emissions would set the pace, incentivized by profits from selling their pollution rights to less innovative competitors. North American lakes are still recovering from the damage done by pre-1990 acid rain. And, of course, acid rain has not been eliminated, only very substantially reduced. But still, that reduction is a success story. And it’s a success story that showed the way to other environmental possibilities, including the ultimate challenge: a reduction in greenhouse-gas emissions. But what George H. W. Bush proved 28 years ago was that progress can be achieved—and that a market-oriented Republican can head that progress, in a way consistent with market principles. He debunked the “It’s not harmful” and “If it is harmful, it’s not man-made” excuses from self-interested groups and their hired mouthpieces. Along the way, he demonstrated a commitment to mutually beneficial partnership with America’s neighbors and friends. All these things were done before. They can be done again. George H. W. Bush showed us how. Let that be remembered when he is lowered into the earth he did so much to protect and restore. Almost two-thirds of panelists indicate they have lowered their forecasts for business investment in 2019 as a result of U.S. trade policy, while two-thirds have raised their inflation forecasts moderately. Forty-one percent of panelists indicate that they have lowered their forecasts for personal consumption expenditures, while a small majority reports that trade issues have had no impact on their forecasts for personal consumer expenditures.